The Economist is the magazine industry's undisputed star performer, achieving 61 consecutive circulation rises over the last 31 years, but group chief executive Andrew Rashbass expects global print sales to fall for the first time in 2012, so why is he "delighted"? Ask magazine executives to choose one title as proof of the enduring power of print in the digital age, and many would opt for The Economist. At 169-years-old, the self-styled "well written and red" newsweekly has always forged its own path. Copy-rich, byline-free editorials, and restrained design, have helped the free-market proponent buck the wider economic malaise, to report record profits of £63 million last year. Since 2004, during which time the typical top 100 selling UK magazine has seen circulations tumble by more than 25%, The Economist’s print base has grown by more than 40%. During the same period, global sales of The Economist have been even more pronounced, rising 50%, to 1.5 million. So, why the apparent nonchalance about the prospect of its first print circulation fall? Rashbass explains: "At some point in the not too distant future, our print ABCs [circulation] will go backwards. But I think it’s a good thing [because] our [overall] circulation continues to rise, and because we charge the same price whether you read it digitally or in print. "I probably make more money if you read it digitally, so I’m actually delighted. If you want to give me £120 [annual subscription] to read it digitally instead of reading it in print, I’m delighted." He adds that he does not expect to see global print circulations fall in next week’s ABC report for the second half of 2011, but anticipates it will occur "at some point during this calendar year". And so begins an illuminating encounter with a man who, until recently, has steered clear of the media spotlight. Having joined the publisher in 1997, 46-year-old Rashbass was promoted to group chief executive of The Economist Group in July 2008. Insights gained from earlier roles as managing director of Economist.com and publisher of The Economist, will be helping to guide Rashbass as he now seeks to extract revenue from an increasingly digital operation. Over the years, the magazine has benefitted from strong annual subscriptions, responsible for around 85% of total circ in the UK. Such strong subs have helped mask The Economist's own battle with weekly newsstand sales, which have fallen by almost a third in the last four years, and now account for less than 27,000 copies. Rashbass concedes "newsstand, as an industry, is struggling," but suggests The Economist’s marketing campaigns have also been converting one-time occasional weekly readers into annual subscribers. Swapping erratic newsstand sales for locked-in subscribers, and all their personal data, is a trade off any publisher would welcome – although for an editor, it’s difficult to beat the satisfaction of copies selling well off the shelves. In addition to changes in consumer consumption, Rashbass identifies nearing a commercial tipping point for The Economist in some major markets too, with advertisers increasingly seeking brand opportunities beyond the page. Drawing on findings in the US, which as a market is easier to track as it works on ‘RFPs’ - request for proposals – the chief executive reveals that in 2011, requests for multi-channel RFPs were up 30%, while print-only RFPs were flat. The group leader says: "This is indicative of the way in which the industry has gone, and gone very quickly. Print is very important, but only part of the story. We will continue to concentrate on serving our clients needs." Advertising makes up between 45-50% of total revenues at The Economist, depending on the current climate. Rashbass believes that increasingly brands are not distinguishing between print and digital opportunities. He says: "They are more manifestations of the same proposition to the same audience, bought and sold in exactly the same kind of ways." The point resonates with Vanessa Clifford, head of press at WPP’s Mindshare, who plans campaigns for a number of Economist advertisers, including Jaguar, HSBC and IBM. She says the brand’s experimental approach to the digital space has been "very smart", with its mix of free sample content and on-brand quality reading experience. Clifford adds: "In my experience, clients find it easier having a multi- brand platform conversation with The Economist than other, more general, media brands because of the strength and uniqueness of its content. "They want to reach The Economist reader, regardless of platform, and are willing to pay to do so." The press specialist also believes advertiser sentiment to appearing on tablet apps points to an encouraging new growth area for the wider publishing industry, which she only tempers due to the still relatively small numbers of tablet owners. "Everything we’ve seen to date suggests that clients understand the strength of ads on tablet editions," she says. "If anything, they now expect better engagement figures in terms of dwell time and response rates than they do for traditional print editions." Rashbass’ own observation is that time spent on The Economist’s iPad app are somewhere between 90 minutes and two hours per week, longer than the average time spent with the magazine. Digital-only sales of The Economist for tablets, e-readers and the web reached 100,000 for the first time in October, and a further 300,000 print subscribers also read the paper digitally. Apple's smartphones and tablets are credited with underpinning much of the growth, and the group CEO is quick to credit the "game-changing" role they have played in propelling this side of the business. For Rashbass, the popularity of the multimedia capabilities of both the iPad and iPhone feeds into a deeper philosophy that now pervades The Economist; a belief that regardless of demographics, people enjoy "smarting-up", despite living in an era more readily defined by dumbing-down. To illustrate this optimistic world view, dubbed "mass intelligence", he points to nearly eight million visitors to the Louvre each year, and, closer to home, queues around the block for Leonardo da Vinci’s exhibition at The National. The success of cable TV broadcaster HBO, home to The Wire and The Sopranos, is offered as further evidence, along with the time when the UK’s most popular newspaper, The Sun, realised the value in buying all the tickets to the opening night of Don Giovanni at the Royal Opera House for readers in 2008. This concept formed the basis of a strategic shift in The Economist's own advertising by Abbott Mead Vickers BBDO in 2010, when it launched its on-going ‘Where do you stand?’ debate-led campaign. Rashbass says: "IPads are the perfect device for the age of mass intelligence…this world where you lean back and get any television you want, visit any gallery you want, have all the world’s information at your finger tips, and have the wonderful ability to read The Economist. "It is a game changer and hugely positive for us. This new kind of lean back [via tablet] is actually an even better way for people to read The Economist." Recognising that The Economist’s biggest battle in today’s multimedia environment is not against another media owner, but actually for people’ s time, the apps carry a "full audio" feature, which have been brought to life by the new handheld tech. Seven hours of content is downloadable by Friday lunchtime of publication, creating new "media time" for time-starved commuters. Rashbass calls the entire new tablet experience "lean back 2.0", and believes it will be "the next major trend whose time has come". 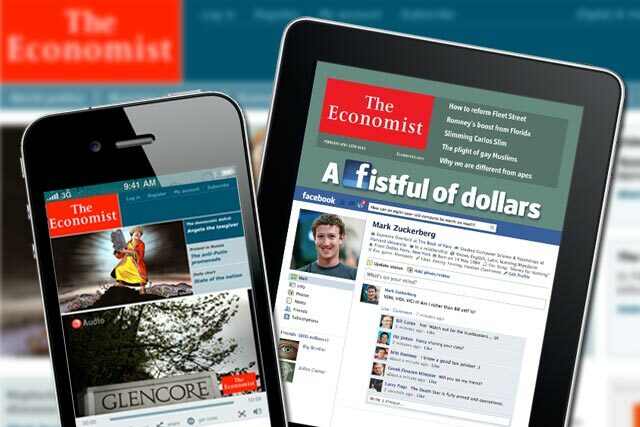 Commercially, digital editions are also said to stack-up too, with an ad page in the UK edition of The Economist costing just under £20,000, Rashbass is adamant that for tablet ads, "CPMs roughly match those of print". Group operating profit was up in the first half of 2011 to £26.2m, with 4% revenue growth being largely attributed to new digital audiences. Its significance is not lost on Clifford, who says: "It’s early days, but the rise of the app appears to be creating a bridge between the paper version and online activity. It is helping publishers bring it all together and start to make sense of their digital opportunities." But what of the dangers of simply migrating print subs to digital editions, where unlike with magazines there is no 20% Vat exemption in the UK, and the prospect of Apple’s 30% cut? "For us, digital is not a zero sum game," says the chief executive. "There is absolutely the opportunity to see composite growth. Digital editions of The Economist reach new readers all round the world as well as providing even more value to our current subscribers." Going forward, the majority of net paid circulation growth is expected to come from digital editions. At least another 100,000 global subscribers are anticipated by the end of 2012, with the UK expected to make-up around 10% of that. Rashbass says: "The potential audience for The Economist we believe is huge. I remember when we celebrated the million – it took us from 1843 to 2003 to get there, and we’re now at 1.5 million nine years later. That’s pretty good going, but I believe the potential for three million people is absolutely there."